An eight part series for Channel 5, It went out in the autumn season of 1998 at 8.30 pm on a Monday night. The programmes were a combination of entertainment and information. The premise of the show was that I would go to the homes of a couple not necessarily husband and wife, just a couple of people who shared an interest in a type of antique or collectible. We would chat about the things they liked and what they were looking to purchase next, then I would take them to various places to search for a piece. We might go to a Country House Sale or Auction House and I would advise them, give them the benefit of my experience and expertise at the same time viwers could pick up tips on what to look for and how to bid. Bargain Hunt is the show that gives two teams of amateur antiques collectors £500 and just one hour to go out into an antiques fair and find themselves a bargain. In about a weeks time the items they've bought go into a real life auction to be sold hopefully for a profit. The team who makes the most profit is the winner. But any profit the teams make is their's to keep. 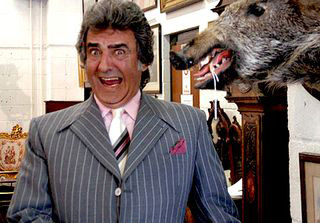 When the show was pitched to me I thought 'hang on, we've got a problem here, we are buying in a semi-retail situation at fairs and selling back to wholesale at the auction ' but with the application of some light hearted comments the show became a fantastic success with viewers. Our day time slot ended up with ratings in the millions, beating the other TV Channels hands down. 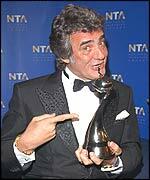 In 2002 I was delighted when Bargain Hunt won the prestigious National Television Award for Most Popular Daytime Programme and it continued to win the ratings war. We made some hour long 'live' versions which were very exciting to host, had special shows with Celebrity teams competing for charity and I also took the show to a prime time slot before deciding to move on to new ventures in 2004.